Hello, everyone! 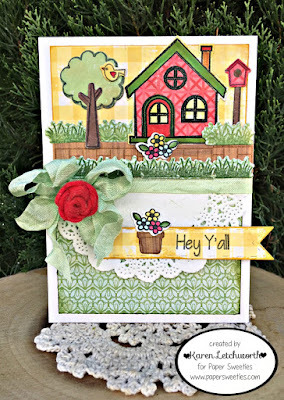 Today I'm sharing a card that made using the New June Release sets from Paper Sweeties. They will be available for purchase as of tomorrow, so today is a great day to start making a "Wish List". You will absolutely LOVE everything from Paper Sweeties. I know I sure have fun playing and creating with mine. Here's what I came up with for today. 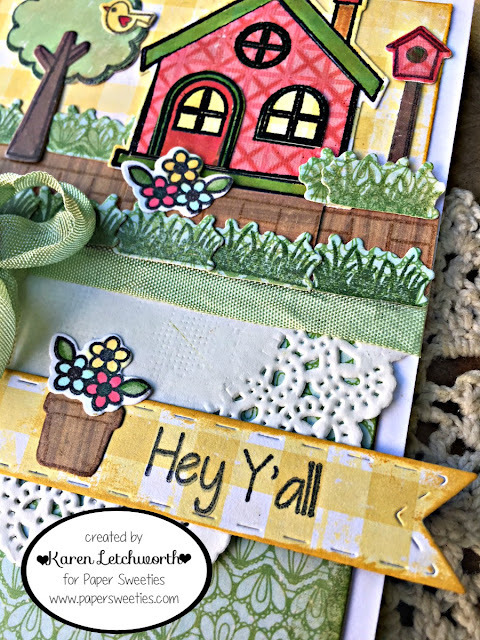 This card was created using a combination of new and old Paper Sweeties products, which is PERFECT because all of their sweet products - including the stamps, sweet cuts (dies), and embellishments - work together beautifully and compliment one another SO well. 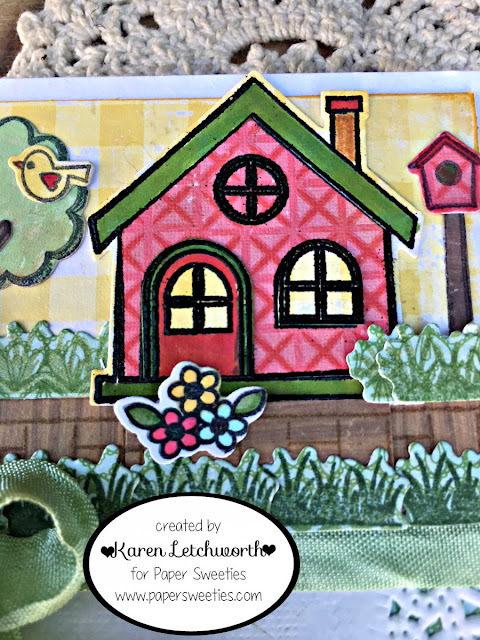 For instance, for this card I used the brand new Treat Box Add-Ons Home & Garden Stamp Set and the coordinating Treat Box Home & Garden Add-Ons Sweet Cuts from the June Release to create the tree, the bird, the birdhouse, the sidewalk, shrubs, flower pot and flowers. And....from the May Release I used the sweet Hey Y'all Stamp Set for the sentiment, and I stamped it on the flag banner found in the Sweet Borders Sweet Cuts. The house is from the Home Is Where Your Story Begins. I love that saying...Home Is Where Your Story Begins (available in the set) because that's where we feel most alive and comfortable. This new release celebrates "home", and everyone on the team has created such cute houses to inspire you. I added half of a white doily, and then I ran a width of Mint Seam Binding across my card and tied it into a double bow. To create the reddish-pink rosette in the center of my bow, I cut a piece of wool felt using the Circle Scalloped Frames Sweet Cuts and cut the smallest size circle. I made a cut in the outer scalloped part of the circle, and rolled it into a rosette; securing it with crafting glue as I rolled it. Perfect! Another creative idea to show how incredibly versatile these sweet products truly are. Every month, our talented Design Team has SO much fun creating with Paper Sweeties products; and we all know that you will absolutely adore everything you purchase from Paper Sweeties as much as we do! Here's a list of my teammates who have created something to inspire you today, and we'll all be back again tomorrow with another post for you. I sure hope you will check out the darling new sets available tomorrow at Paper Sweeties. Crafty Hazelnut's Patterned Paper Challenge - June/Anything Goes - I used lots of fun patterned papers from Crate Paper. Words 2 Craft By Challenge Blog - Challenge #54 - Where You Feel Most Alive - As I talked about in my post, home is where I feel most alive and where I can really be myself. We are so blessed to have a place to call home, and there's truly no place I'd rather be. Oh what a fun card Karen - love how you have used the paper and images to build up this sweet card. 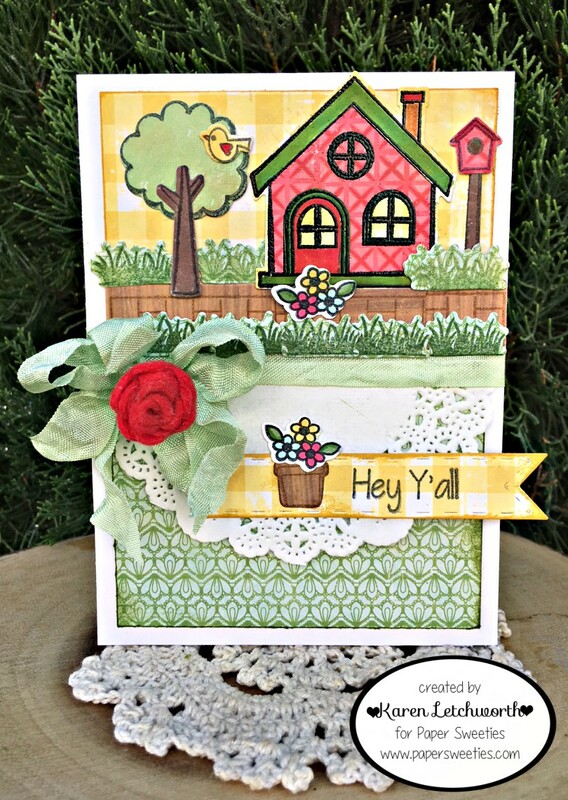 What a darling scene you've created with all the home & garden elements!! How cute! 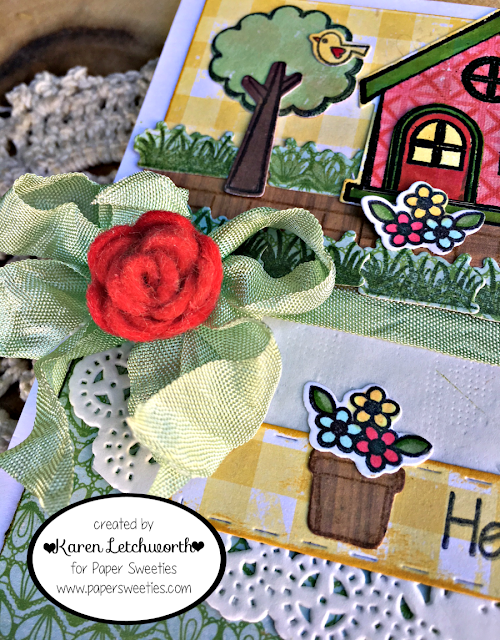 Love the sweet scene you created and the gorgeous crinkled ribbon! Beautiful card with all those darling sweet images from the new set, Karen!! A perfect summer card! Wonderful color and design, too!! Beautiful ! So many pretty details! Love the doily! Beautiful elements, and I love your description of home!! What a wonderful scene! I really like your card! Thanks for participating with CraftyHazelnut’s Patterned Paper’s June challenge! What a darling little scene you created! Love your take on the word challenge. Thank you for joining us at W2CB!